My next interview was for a receptionist position at a big law firm on Church Street, but when I met with the human resources lady, before I could say a word about which job I was applying for, she took one look at me and shook her head, and then she quickly told me the job had been filled and then she started typing really fast and didn't look at me again. I stood on the sidewalk in front of the building in my dowdy interview outfit feeling waves of shame as office workers on their lunch hour brushed by me. I had just been intercepted attempting to pass myself off as a regular person. I applied for a job at the bookstore on Whitney Avenue where my family had bought books my entire life, but the formerly friendly owner was abrupt with me and vague about actually needing anyone after all, even though there was a hand-lettered sign on the glass door advertising his need for part-time help. As I turned away I caught him rolling his eyes at one of his employees, a soft-spoken retired music teacher who had always been nice to me and who shared my mother's passion for Angela Thirkell novels. In the glass of the door, I could see her reflection, shrugging and grimacing in response as I made my way out. At Helen's Double Dip out in deepest Milford, nobody asked me anything about whether or not I was going to college, and more significantly nobody seemed to notice or care that they were hiring a renowned pariah with a criminal record to work a daily shift from nine to six. All Freddie, the manager (with his Don Ameche mustache and his terrible acne scars), seemed to care about was my comprehension of the rules, which mandated showing up on time, thorough hand-washing, correct scooping technique, and the strict limit of three free samples per customer, no exceptions, not even for friends. I assured him I had no friends. Alice's extreme personality is at the center of Katharine Weber's exuberant psychological comedy, her fifth novel, and even though we quickly learn to not always believe Alice's version of the events that make up this story, we cannot deny her sense of dejection. Unloved by her own parents, bouncing between two psychotherapists (she actually cheats on her shrink), this anguished lonely character is destined to cause trouble. Alice is a hopeless teenager when she lands in a big pot of chocolate. She arrives for a job interview at the Zip's Candies factory in New Haven, owned by the Ziplinsky family, whose young prince "Howdy" she will eventually marry. 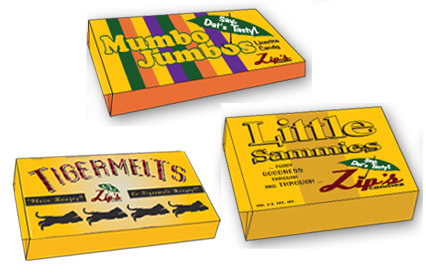 Zip's Candies has plenty of its own problems: the management is scatter-brained, the equipment is falling apart, and the brands -- Little Sammies, Tigermelts and Mumbo Jumbos, all inspired by the tale of Little Black Sambo -- carry a racially offensive legacy that nobody can figure out what to do about. First as a factory floor employee and then as a company executive, Alice finds her sense of self by achieving competence as a candy-maker -- something that no other member of the family's younger generation is able to do. Alice's feel for candy resembles a musician's feel for an instrument, and the passages throughout True Confections where she talks about the science, engineering and aesthetic philosophy behind chocolate manufacturing are a thrill to read. At Zip's Candies, Alice the social reject has found a place messy enough to accept her. We watch as she gratefully sheds off her sense of displacement in the world, as in a hilarious long sequence at a candy industry trade show in New York City's Jacob Javits center. The candy industry gives Alice the high school clique she never had before. She even begins to dream that she has found a family that loves her. Like all of Katharine Weber's excellent novels -- I've now read all five -- True Confections is about family. Other reviewers of this novel may focus on the fact that this is a book about candy, but I find it more significant that it's a book about food, nourishment. The true detail that emerges during one of Alice's soliliquies that there was once a candy bar called "Chicken Dinner" is especially significant in this context. True Confections is also about the meaning of work in our lives. Weber's first three novels, Objects In Mirror Are Closer Than They Appear, The Music Lesson and The Little Women presented charming characters from pampered backdrounds, expensively educated and surrounded as children by art. True Confections continues in a direction pointed to by Weber's stunning fourth novel Triangle (a Litblog Co-op Nominee in 2007) in portraying characters from starker backgrounds who toil in factories and see little art in their lives. Both milieus seem to bring out this author's best. True Confections proves once again how crafty Katharine Weber is, and I hope a wider range of readers will take the time to discover her unusual work, even though she's hard to place, being as clever as Lorrie Moore, as unpredictable as Richard Powers, as metafictional as Paul Auster, as obsessed with literary history as J. M. Coetzee. Readers of True Confections may also detect some influences from a few Russians -- Gogol, Dostoevsky -- in the character of Alice Ziplinsky, along with traces of Unwrapped and How It's Made (Weber reveals in a recent interview that these television shows also influenced the work). I'm very much looking forward to asking Katharine Weber more about her new novel and other things in a reading/interview we are doing together in Brooklyn, New York on Monday night at the Greenlight Bookstore. More info on the event is here -- please come if you're in town! Katharine's own thoughtful blog Staircase Writing is here, and you can singalong to the Zip's Candies theme song here and here. 1 Response to "Comfort Food: True Confections by Katharine Weber"
Very clever stuff from a very clever writer. I've gotten a real kick going thru the furnished links you provided. I'll be on the alert for your review Tuesday, Levi. Have fun!